The Knife frame is all hand made in the USA, and made out of the best wood and craftsmanship. We take pride in any Knife display that we manufacture. Our Knife Displays have a protective glass in the front of the case, in order to protect your knife. 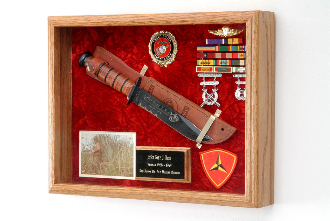 The knife Frame is an idyllic solution for displaying your most prized accomplishments and knifethe case is stately looks and solid construction with an incredible bargain.